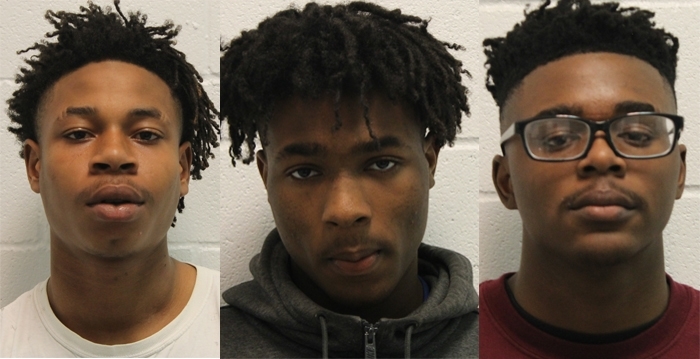 March 3, Red Oak Police arrested Taquavein Jasean Barnes, 17, from Dallas; Jermiah Elijah Griffin, 17, from DeSoto and Tyler Jahari King, 18, from Lancaster. All three men face multiple burglary charges. RED OAK—Walmart Supercenter #3433 has been the site of a number of car burglaries in the store parking lot over the last few months. Most recently, the box store located in the 100 block of Ryan Drive, had as many as four vehicle burglaries in one day. On March 3rd, Red Oak Police were originally dispatched to the location on a theft in progress call. Three black males entered the store with backpacks. When the men exited, the security alarm sounded. Red Oak Police found the suspects were in possession of stolen merchandise in the backpack. These items matched stolen property from four separate burglary of vehicle offenses earlier in the day. Tyler Jahari King, 18, from Lancaster; Jermiah Elijah Griffin, 17, from DeSoto and Taquavein Jasean Barnes, 17, from Dallas were all taken into custody for their involvement in the burglary offenses. The three men were taken to the Red Oak Police Department and charged with four counts of Burglary of a Vehicle. All three were additionally charged with Engaging in Organized Criminal Activity. King was also charged with Failure to Identify Fugitive from Justice. According to reports he had an outstanding warrant for theft of property ($100-$750) from the Dallas Sheriff Department. This last offense was added when police discovered King had provided false or fictitious identifying information. The subjects were arraigned at $5,000 for each burglary of vehicle charge as well as $25,000 for engaging in organized criminal activity. King was additionally arraigned for $1,500 for failure to identify and $500 for the theft of property charge. The men were later transferred to the Ellis County-Wayne McCollum Detention Center. Police believe that these arrests may be connected with several additional theft and burglary of vehicle investigations that remain active. The Criminal Investigations Unit is in the process of obtaining additional arrest warrants for these offenses.